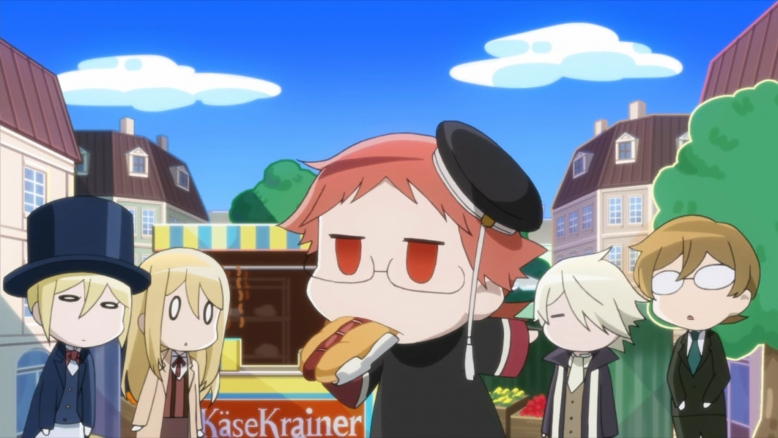 Heine organizes a field trip into the city of Wiener (I know, I giggled too) so the princes can see how the common folk live firsthand. With their tutor as their guide, the boys follow their hearts and stomachs to new joys and troubles, learn a few lessons along the way, and even fit in some time for a pair of good deeds. I told you they were good boys. It’s gonna be hard for me not to turn these commentaries into one long recap of Things That Delighted Me, because lemme tell ya, I could almost certainly fill 1000 words just reliving every gag that got me to laugh out loud or every scene that got me to write “PRECIOUS CHILD” in my episodes notes. 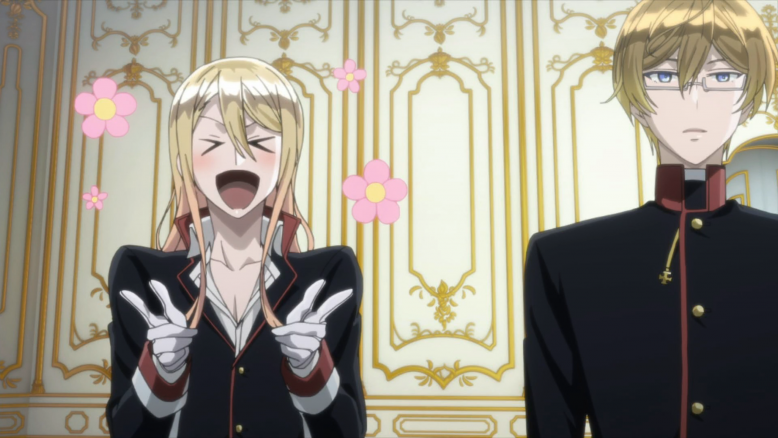 The Royal Tutor has charm coming out of its ears, and characters that provoke a “wow, same” from me more than any show since Tanaka-kun (Bruno in particular is quickly proving himself to be my anime alter ego). 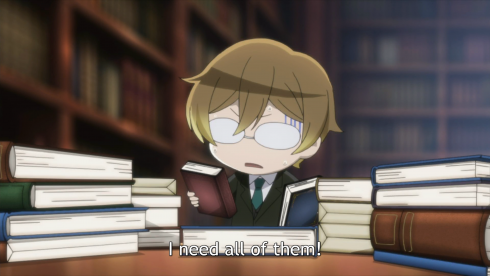 But I also get the sense it’s a series that has something to say between the giggles, so I’ll do my best not to get too distracted by the chibis so I can talk about all that good stuff, too. NO! STAY FOCUSED. Don’t get distracted by the chibis! DON’T YOU DO IT, ME. Kai loves animals, of course, but he’s also quick-thinking and knows when to act decisively. His difficulty speaking turns into an asset when he chases after the purse snatcher instead of wasting time talking about it like his brothers do. Bruno loves books, of course, but he’s also practical and restrained, dedicated to sticking to a budget in a way that’s surprising for a wealthy young prince. Leo’s had the most screentime so far, so we don’t learn more about him so much as get a better sense of how his internal conflicts play off each other. His pride continues to mask his insecurities (notice how his upturned nose about commoners quickly turns into a fear of them), which in turn continue to mask his desire to be a kinder, smarter, more capable person. He fumbles and panics through this entire episode–terrified of commoners, baffled by money, nobly swearing to rescue a woman’s purse only to have Kai beat him to the punch–but all that fumbling means he also learns more than the others do and sees the greatest character growth. Leo goes from a smug “Why would a royal ever need to know about commoners’ lives?” to “I want to beat up all the bad guys and make this kingdom full of smiles!” (THE PRECIOUS CHILD) (ah-hem). That’s pretty impressive for a single day trip. I AM UNSPEAKABLY PROUD OF YOU. Meanwhile, Licht…is a wild card. He’s more worldly than his brothers thanks to his frequent trips into town, but he’s also the least interested in improving himself. And while he’s a lot less airheaded than he initially appears, it turns out he is still an airhead, given his sudden realization that he has no idea how to get around town without his lady friends to guide him. He does remain the most mean-spirited of the kids, mocking Leo for his failed attempt at heroics, but he also orchestrates the gifts (and possibly the entire dinner party) for Heine, going out of his way to make their tutor feel welcome, so…? I think there are two possibilities here. Either Licht is a self-centered (but not inherently cruel) 14-year-old rich kid driven by his own fickle whims–ask someone invasive questions one day because you feel like it, throw that same person a party another day because you feel like it–or he’s more cunning than I’d thought and is still playing a quiet power game, hoping to ingratiate Heine to him so Heine will be less strict and Licht will have more freedom to fool around like he did before (or maybe so Licht can finally find out more about Heine). Time will tell, but I ain’t takin’ my eye off this kid ’til it does. You can’t fool me with your bishounen flowers, Mister. You may have noticed I spend a lot of time talking about my precious children the princes. This is because (a) I love character analysis a whole bunch, and (b) The Royal Tutor‘s broader ideas are communicated through its cast, so talking about their specific actions helps set the stage for the overarching points. And mixed in with all the boys’ day out antics are a few central threads this week, all of which form a nifty little thematic two-way street between Heine and the royals. He is also a Disney princess. But this lesson isn’t only for the kids. 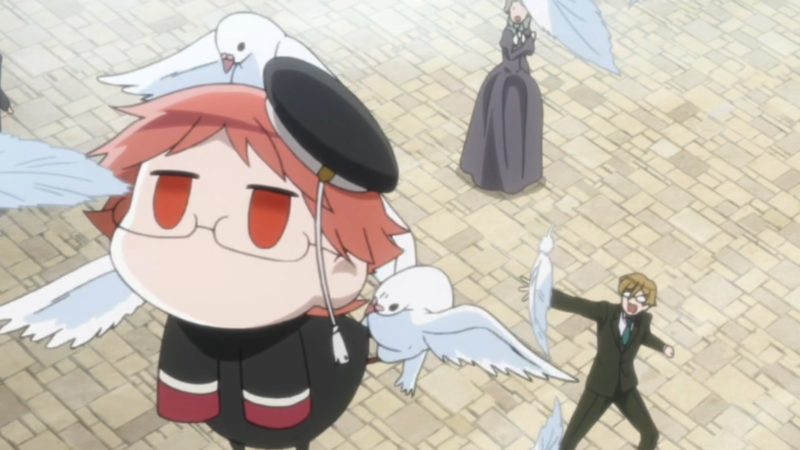 Heine has his own weaknesses, and I don’t just mean his inability to feed pigeons without becoming a sacrifice to their cooing god. Heine is limited in what he knows about the royal family, but he doesn’t realize it. 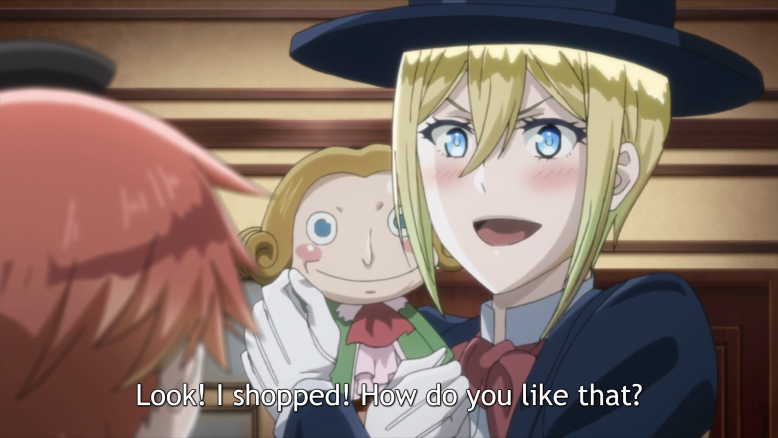 Like Licht, he has more confidence than he should, convinced he knows exactly how to read his students after only a few short days; and, like Licht, he has to learn throughout this episode that he’s wrong. 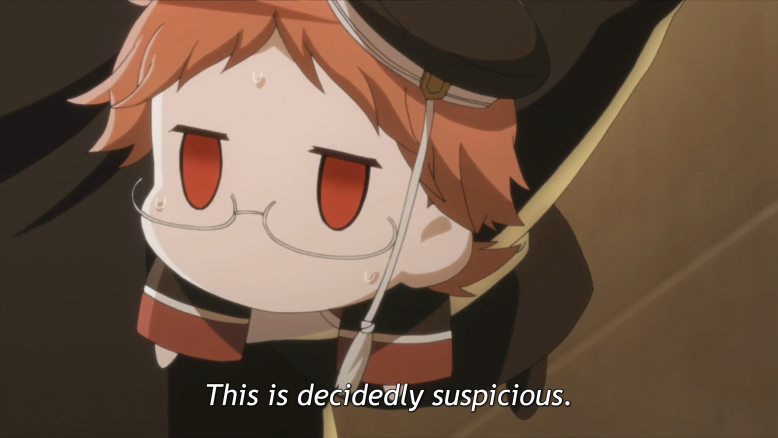 Which brings us to The Royal Tutor‘s ongoing and favorite theme: The danger of assumptions. This is best seen in Leo’s unfounded scorn for (and later fear of) commoners, as well as Heine’s belief that the princes were whispering because they were Up To No Good–and that they weren’t sharing the secret with him because they still saw him as an outsider. 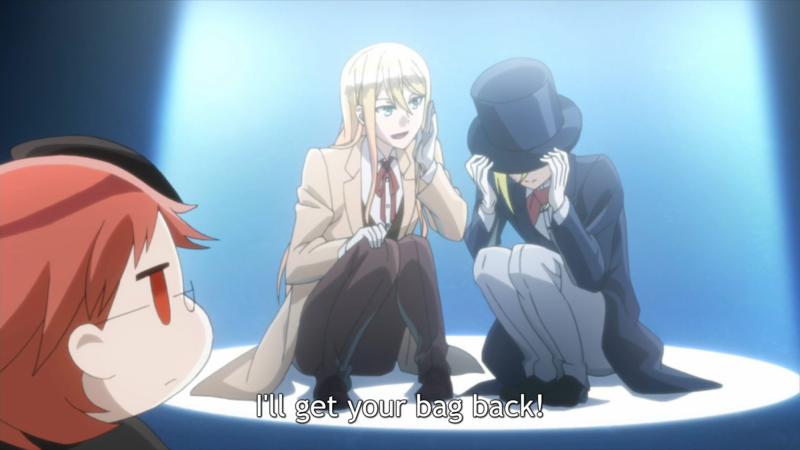 (I confess I shared Heine’s suspicions, fully convinced Licht was trying to pull a fast one on their tutor. Sorry, Licht!) 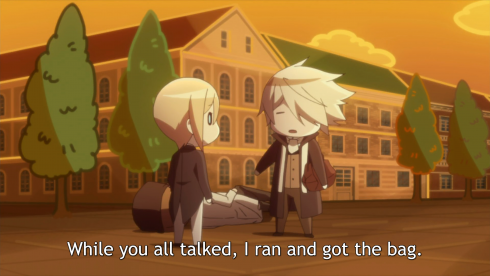 Heine may have decided to trust his own experiences rather than gossip back in Episode 2, but that experience is still minimal, and he shouldn’t assume he knows everything about them yet. Both Leo’s and Heine’s assumptions come from making a decision about someone without fully understanding them. And, importantly, both characters’ concerns are resolved by forming closer connections with the people they made assumptions about. Leo interacts with a pair of commoners and realizes they’re not angry executioners, but humans with bonds similar to the ones he shares with his family. And, when the boys reveal their secret, it shows Heine that they’re not as cold towards him or as troublesome as he’d thought. 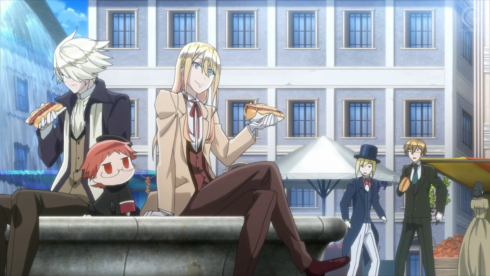 It’s a sweet moment of symmetry: Heine helping the boys (royalty) connect with the commoners, and the boys helping Heine (a commoner) connect with the royals. Granted, the princes are still learning, so they don’t get it all right. They don’t know Heine well enough to know what to get him, so they end up getting him gifts they like rather than things they know he’ll like (although Leo does at least try to get Heine’s agreement on that wonderful doll). Still, just like Leo bravely dashing off to rescue a purse that’s already been rescued, it’s the thought that counts. The gifts still assure Heine that the princes really have welcomed him into their home, and that’s a great start. Even so, all is not sunshine and rainbows in Weissburg Palace. Despite the dinner party, Heine still keeps himself at an emotional distance, convinced he “doesn’t belong” (either due to his commoner status or that mysterious past you just know is gonna come up soon). As this episode demonstrated, trust and understanding are a two-way street. 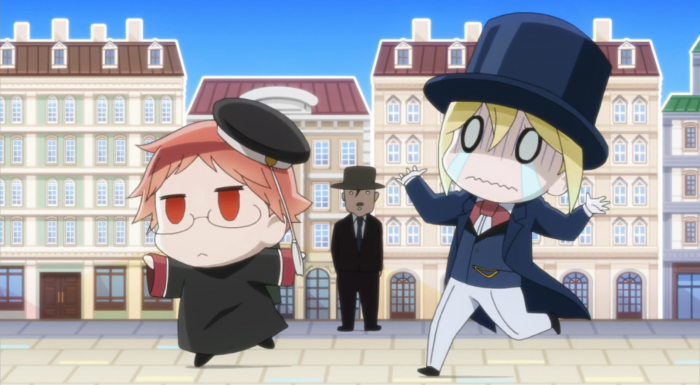 Heine wants his students to accept his place in the palace, but even he hasn’t fully accepted that place. 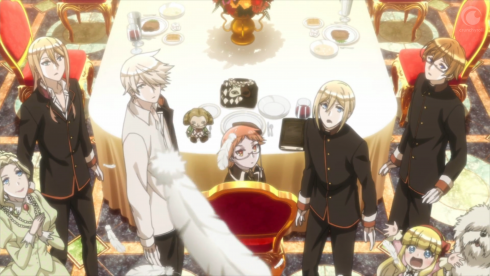 The boys still have a lot of learning to do, but The Royal Tutor may wind up being more about Heine’s growth when all is said and done. ICYMI, Heine’s new book is called The Master and Apprentice’s Journey of the Heart. Oh, Bruno, you persistent puppy. The world-building in this series is quietly really good. They’ve smartly avoided any lengthy InfoDumps, but at the same time just about every episode contains references to serious economic hardships and unrest in the kingdom’s recent past (“30 years ago,” Heine noted in Episode 2). I suspect all this is setting the stage for the inevitable reveal about Heine’s difficult childhood, and why he feels so personally motivated to make sure the kingdom’s future is in good hands. 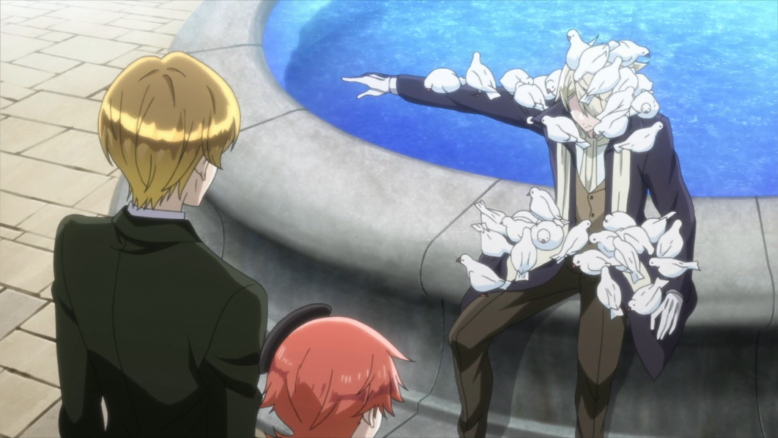 Funny Bone Destroyer: My roommate had to poke his head in my room to check up on me because I was laughing so hard at the one-two punch of Kai covered in pigeons and then Heine getting carried off by them. “Please do not feed wild birds” indeed, subtitles. This Week’s Lesson: How does one grow big and strong? “Eat well, sleep well, and cuddles everyday.” Truly, Kai is a modern sage. Dee (@joseinextdoor) is a nerd of all trades and a master of one. She has bachelor's degrees in English and East Asian studies and a master's degree in Creative Writing. To pay the bills, she works as a technical writer. To not pay the bills, she devours novels and comics, watches far too much anime, and cheers very loudly for the Kansas Jayhawks. You can hang out with her at The Josei Next Door and support her work through PayPal. No Spoilers of Any kind please. No hints, no discussion of future stuff from the source manga/light novel. Keep the discussion to the current episode's events, and that's it. No personal attacks. Debates/Disagreements are okay, but keep things civil and be nice. No advertising/Links to promote your personal website/article/products. We have a way to advertise on the site if you're interested.